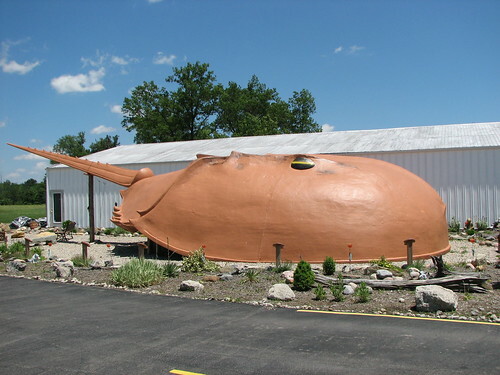 The World's Largest Horseshoe Crab can be found in the small town of Blanchester Ohio. The sculpture was created by Farren & Associates for the Baltimore Maritime Museum, Baltimore, Maryland. It was later acquired by Creation Museum for display at their museum at Hebron, Kentucky. However it was too big for their building and was ultimately gifted to the Freedom Worship Baptist Church in Blanchester, Ohio, where it sits at entrance to the Biblical Scripture garden. 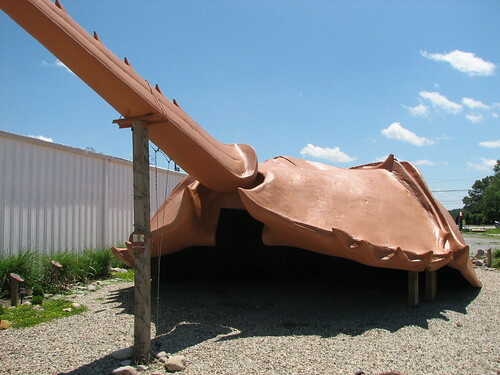 The 55 feet long (head to tail) and 25 feet wide crab can accommodate about 60-65 persons and has been used for weddings, family reunions/parties, church and business functions etc. It is a shame it was too big for the Creation Museum. I live just a few minutes from there and it would have been cool to see from the expressway.